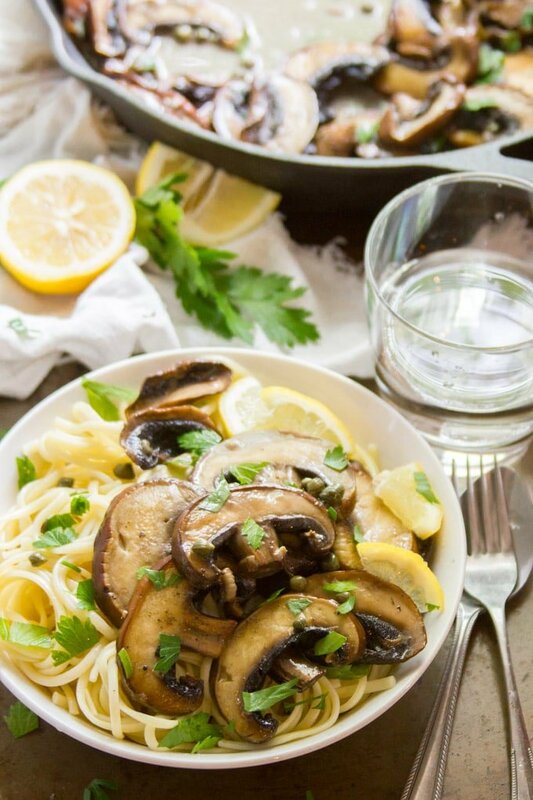 Baby portobello mushrooms are tossed in zippy lemon garlic cream sauce and served over pasta to make this luscious vegan scallopini! I was going to wait until fall to post this one because between the mushrooms, the creamy sauce, and the pasta, it’s rather hearty. Also, I was considering not posting it at all because as soon as I started cooking it up I realized I’ve already shared recipes for tofu scampi, cauliflower piccata, and mushroom marsala, and they’re all kind of similar to scallopini. But they’re not exactly the same thing. Also, this stuff is delicious. So here I am with the recipe. You’re going to want to make this one. Honestly, I’m not 100% clear on all the differences between the dishes I mentioned above and scallopini. They all traditionally involve chicken or veal in lemony sauce over pasta. But I have noticed that some scallopini recipes use cream sauce, and I didn’t use cream sauce for any of the others, so I did that here. Was this sauce ever good! It has all the lemony garlicky deliciousness of all my favorite veganized lemony garlicky dishes with extra richness, thanks to a bit of coconut milk. The creaminess is light! It’s not like an Alfredo sauce ? more like bathing the noodles in a silky coating.